Islamabad (Staff Report): Former interior minister and Pakistan Muslim League-Nawaz (PML-N) leader Chaudhry Nisar Ali Khan on Friday announced that he would reveal in next few days why he refused to take any post in the current federal cabinet. He reiterated his support for former prime minister saying that Nawaz Sharif could be removed as premier, but his place as a leader cannot be taken away. “These days politics in Pakistan has become really difficult. 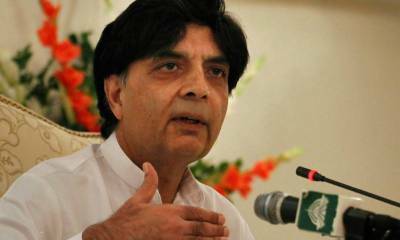 There’s mud-slinging, no differentiation in right and wrong,” Nisar said. Nisar had also alleged that certain individuals had tried to distance him from the party leadership by continuously targeting him for his association with the armed forces.